Producer Cathy Lewis filmed a segment on EllynAnne and her apron journey. Filming and interviews by Joie Chen were conducted September 29 at the Apron Chronicles exhibit opening in Greensboro, NC and October 11 at The Apron Book’s press party in New York, NY. Interviewees include Ellen Levine, author of the book’s Foreword and hostess of the NY party, and contributors to the exhibit, Erin McDaniels Owens and Cristie Coffman. Canvas Conversations: Apron Shaped Stories, a program under the educational initiative “Art is History,” involved a total of 80 students from Garinger and East Mecklenburg high schools in Charlotte, NC. The Charlotte Museum of History’s staff, EllynAnne Geisel-Apron Chronicles curator, and local Charlotte artists spent one full day in each school. The goal of this program was to connect students to the past through the examination of their own histories, while learning how all of this is expressed through art, objects, and storytelling. This program not only provided a fun and interactive way to learn about the importance of history’s natural relation to art, but also promoted a better understanding of why history matters and the significance of material culture in their lives. The American Interest (www.the-american-interest.com) March/April 2011 issue. Myrtle Beach “Ties One On” to celebrate Apron Chronicles successful run! APRON CHRONICLES was a double page feature in Colorado Expressions Magazine. 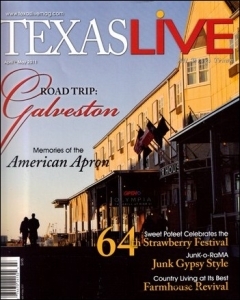 Feb/March 2008 issue. EllynAnne Geisel and Kristina Loggia were interviewed by Jacki Lyden, NPR senior correspondent and host, All Things Considered Weekend Edition. Whitney Museum of American Art, New York, juried the 2004 competition. by the Center for Documentary Studies at Duke University. Apron Chronicles: A Patchwork of American Recollections ISBN 0-9788025-0-0 placed first as the Award-Winning Finalist in two categories: Photography: People and Photography: Cultural Anthropology. in her kitchen wearing the apron she puts on first thing each morning.